The election oversight agency of a Latin America country wanted to help employees transmit vote counts from the country’s many districts during its 2019 elections. The agency wanted to provide mobile devices to workers in those districts, but was concerned the devices provided too many opportunities for fraud and data leakage. They chose a complete solution from Samsung to safeguard their election process, including Knox Manage and Knox Mobile Enrollment. Our client is an election oversight agency based in a Latin American nation. They are responsible for monitoring and regulating the elections in their country. The agency’s major concern was the security of sensitive data transmission. First, the agency helped raise security standards for carriers to help ensure transparency and minimize election fraud. To protect against data leakage and hacking, the agency knew it also needed to retain maximum control over all devices distributed. This meant regulating who used the devices and which apps they accessed. The goal was to prevent unauthorized activities such as sending text messages and emails, as well as misuse in case of theft or loss. To thwart hacking and prevent data leakage, the agency needed employees to use a proprietary application to transmit votes over a secure network. Other requirements included the ability to track device location and monitor usage. And if employees ran into issues during the elections, the agency needed rapid troubleshooting capabilities. Working with its security consultant, the election agency chose a complete solution from Samsung that met all its requirements. "Although EMM solutions can restrict device usage, security can easily be compromised if the devices themselves are vulnerable. Knox adds protection with a multi-layered platform built into the hardware and software." With the Knox Manage enterprise mobility management (EMM) solution, the institution can restrict device usage, monitor and track devices remotely, and troubleshoot issues. With Knox Mobile Enrollment, IT admins can make sure each device includes all appropriate security policies without physically touching it. And with Knox support, the agency is able to simplify lifecycle management and resolve issues faster. 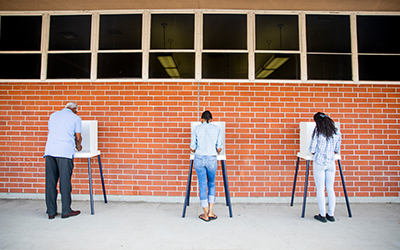 The election agency selected Samsung based on its ability to provide an end-to-end solution—from software and devices to support. With an end-to-end solution that includes devices, a management solution, and support, the agency is able to simplify lifecycle management and resolve issues faster. Instead of spending time trying to understand each issue, the agency can turn to Samsung for comprehensive support. With the help of Samsung’s streamlined EMM installation, enrollment services, and professional support, the government agency has simplified the setup process for both employees and its IT team. With Knox Mobile Enrollment, IT admins can make sure each device includes all appropriate security policies without physically touching it. When the employee receives the device, all that’s needed is to open the box and connect the device to a network. Immediately, the Setup Wizard launches the EMM agent and the EMM automatically applies correct security settings and configurations. The device is then ready for controlled, secure use. The agency selected two Samsung devices built on the Knox platform, renowned for its security features. Knox received 25 of 28 “Strong” ratings in a December 2017 Gartner report and is approved by government and security organizations worldwide. Samsung manufactures and configures its devices in its own factories, and builds the Knox platform into device hardware and software. Knox security complements the Android operating system security and makes Samsung phones, tablets and wearables the most reliable on the market. Learn more about using Knox Manage for your business. Learn more about using Knox Mobile Enrollment for your business.